Sunflowers commonly bloom during summer and a portion of fall with the middle of summer being the peak season. Sunflowers are known for the way the blooms, or flower heads, turn to face the sun throughout the day. They are bright, beautiful, and can bring a smile to a person's face. There are a number of inventive sunflower crafts for you and your kids to create. Some require paint, others require glue, a few household ingredients that you can usually find around the house round out the materials that you will need. These crafts are great for a lazy summer afternoon. Some of these crafts are even suitable for children as young as 1. Grab some rotini pasta noodles, some green pipe cleaners, and yellow paint to craft these cute sunflowers. This noodle sunflower craft offered by Crafty Morning makes for some great summer greeting cards. Recycle an empty oatmeal container to make one giant sunflower by Inner Child Fun. This is sure to bring a smile to your child’s face when it is done. Kids will love this cute and colorful sunflower craft that uses tissue paper for texture by The Spruce. All you need are a few markers and glue. To get a little more creative, you can use patterned papers. Spell out summer with these deliciously adorable sunflower cookies with a recipe from Make and Takes. Your kids will love making and decorating these cookies. Ingredients include sugar cookies, frosting, candy corn, and chocolate chips. Make pretty sunflower napkin rings for your summer table with instructions by She Knows. This is a simple and easy craft for all ages requiring silk sunflowers and green pipe cleaners. These sunflowers from The Imagination Tree are bright, cheerful, and super fun to craft for toddlers to school-age kids. You will need coffee filters, sequins, and green card stock. These giant sunflowers will cheer up any household with their bright colors. This is the easiest craft for little hands to complete. This craft will require a paper plate, tissue paper, glue, and sunflower seeds, which will be glued in the middle of the paper sunflower. This craft idea is offered by Glued to My Crafts. Who knew a fork could be used for painting? 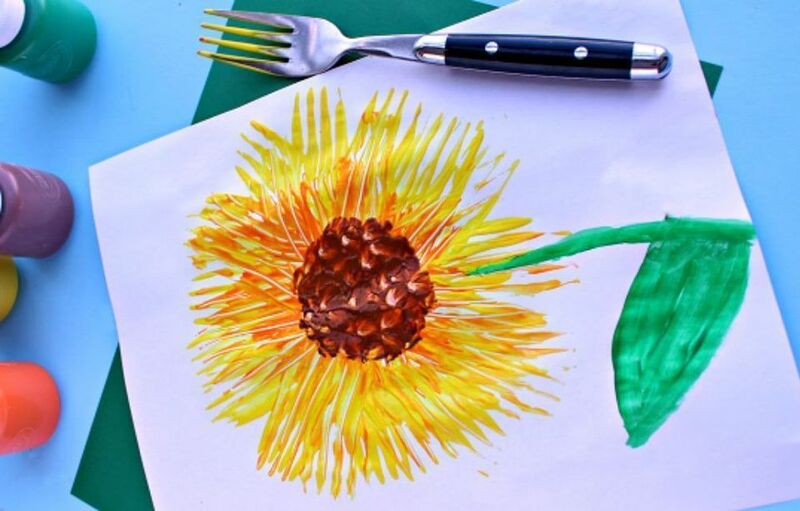 Teach children a fun painting technique using kitchen utensils to make bright sunflowers with this idea by Crafty Morning. Plant these popsicle stick sunflowers in pots to brighten up your home for summer. Even black thumbs will love these plants since you will never need to water them, worry about the temperature, or the proper sun exposure. This idea was developed by Boy Mama Teacher Mama. This sunflower peep cake by Spend With Pennies can need in about 15 minutes. It is so yummy, too. The yellow peeps and chocolate chip combination make it look just like a big sunflower.